If you’ve never visited London, I can (sort of) understand how this megatropolis of often questionable weather, cramped streets packed with confused tourists and angry commuters, a weird tube system and a nation of obsessed tea drinkers might not be your first choice of holiday location. Well, I'm here to tell you that you couldn't be more wrong. For anyone who has visited 'sunny London', this stunningly beautiful, crazy, manic, historical city really leaves its mark, and is the perfect city to get lost in for a day. If you can get over a bit of drizzle (it's not hard, just buy an umbrella! ), London is hands down the greatest city on earth. FACT! 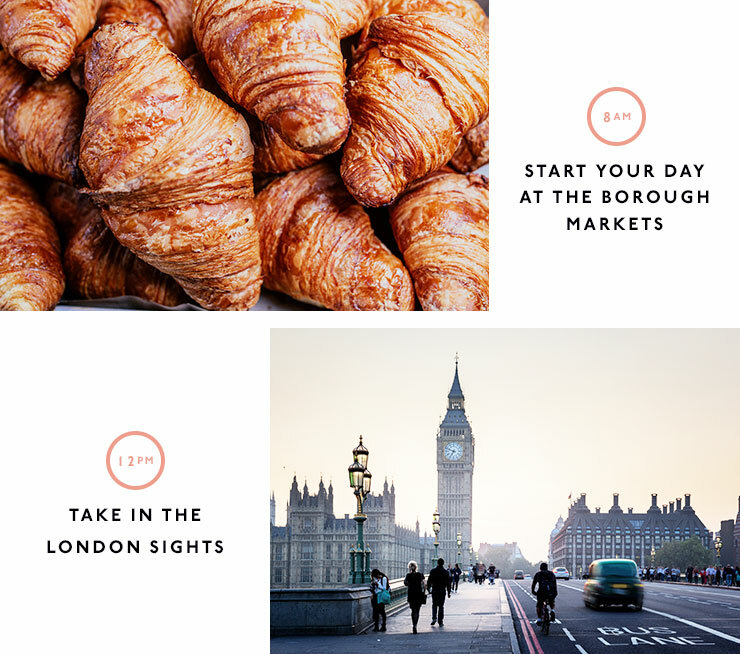 So if you’re planning a trip to the big smoke, or have an impending stop-over, here’s the only itinerary you need to spend one perfect 24 hours in this glorious city. Tally ho! Start the day right, with a trip to Borough Market at London Bridge. This ancient marketplace has been around since 1014—that’s 1,000 years, history buffs—and today, it is a melting pot of beautiful stalls and shop fronts selling everything from pies, to freshly shucked oysters, pastries and cheeses, a huge array of British produce and international cuisines, with intimate wine bars, pubs and cafés immediately surrounding the markets in nearby laneways. Pick up a coffee from Change Please Coffee and join the queue at Comptoir Gourmand for their famous freshly baked French-style cakes. Walk off that breakfast; skip the tube and stretch those legs! London has the most beautiful scenery, especially along Southbank on the River Thames. Hug the riverfront, passing the Tower Bridge, Shakespeare's Globe Theatre, and the Tate Modern. If art is the things that gets your pulse racing, take a stroll around the gallery (it’s free for the most part! )—some of the biggest names in the art world reside here. From here, cross the river over Millennium Bridge, taking in the views of Tower Bridge and the Tower of London on your right towards the incredible St Paul’s Cathedral dead ahead. If you’re feeling fighting fit, climb all 528 steps up to the cathedral’s highest point, and be rewarded with breathtaking views of the capital—and oxygen to your lungs. When in ‘Rome’ stopping for tea is the order of the day, so indulge in a spot of high tea at Fortnum & Mason’s flagship store in Piccadilly. With famous visitors including Queen Lizzie herself (no biggie), this is the ultimate indulgent afternoon pick me up. A day in London wouldn’t be complete without a little shopping. Hit up the beautiful Liberty department store (housed in a Grade II listed Tudor building and open since 1875) for luxury goods and one-off pieces, then colourful Carnaby Street (the epicentre of the ‘swinging’ 60’s) for high street finds, cult beauty buys and cute AF cafes. Pre-show drinks are what London does best! In the heart of Soho (aka theatre land), bars and gorgeous old pubs spill onto the street where you can enjoy a decent tipple before heading on to catch a West End show. Mr Fogg’s Tavern is equal parts whimsy—think taxidermy animal busts and a ceiling covered in antique relics—equal parts dedicated gin bar. The drinks are expertly made and the place is always bustilng. If offered, always have one for the road! Choosing what West End show to see is a tough ask, especially if you’ve only got one night. My advice? Go with a classic. Agatha Christie’s iconic murder mystery play, The Mousetrap has been playing continuously since 1952—the longest running show in the world!—and will keep you on your toes until the very end. 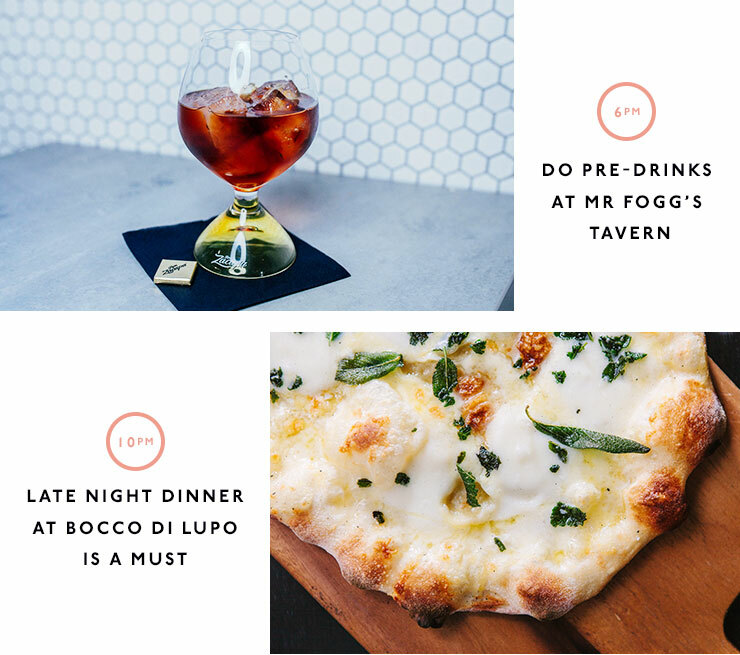 Hands down one of the best restaurants in London, Bocco Di Lupo has an award-winning wine list, is open late, oh, and just happens to serve incredible regional Italian share dishes. Go the fried artichoke, the suckling pig and the clam linguine. Mamma Mia! If you're after something with a little more spice, London's famed Dishoom is worth the queues—promise! Inspired by the Bombay tea rooms of old, tuck in to authentic pau buns, curries and share dishes. Make sure to order the mango kulfi for dessert! The night is young by London standards! Head to the German Gymnasium for an elegant nightcap—they make a mean Old Fashion and have a huge wine list—in this impressive Grade II listed building (seriously, there's history everywhere you look) before bidding this beautiful city a goodnight.